It’s so beautiful out, starting to cool a bit, it has me wishing I could take a couple days off and head to the cottage. Thinking of all this inspired this month’s color of the month! 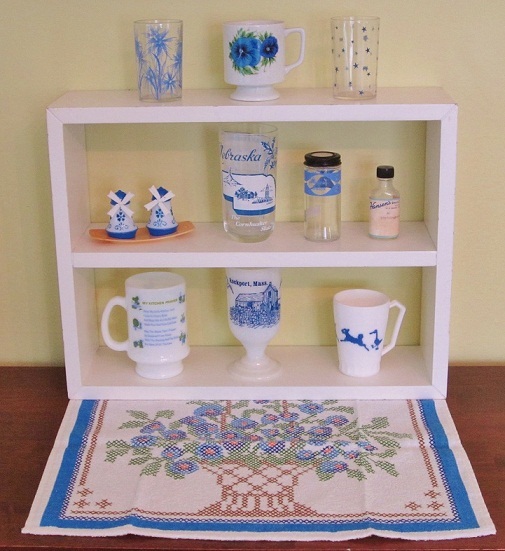 Fave items-Hazel Atlas childs mug, swanky swigs-top shelf, the minced onion spice jar-2nd shelf, and the faux embroidered light terry towel. 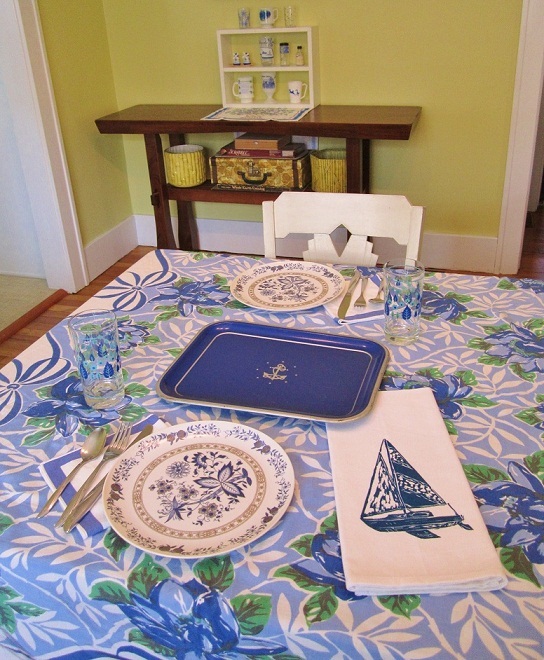 My artgoodies sailboat towel and this vintage anchor tray do the trick for cottage decor! 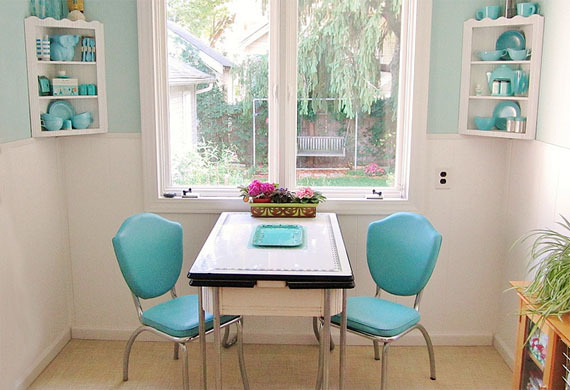 This colorful vintage tablecloth adds some serious pop! Paired with blue edge striped napkins, my usual vintage Twin Star silverware and a couple of my Swiss Chalet glasses. Oh and don't forget this great pair of melmac plates! It’s that time of year again! 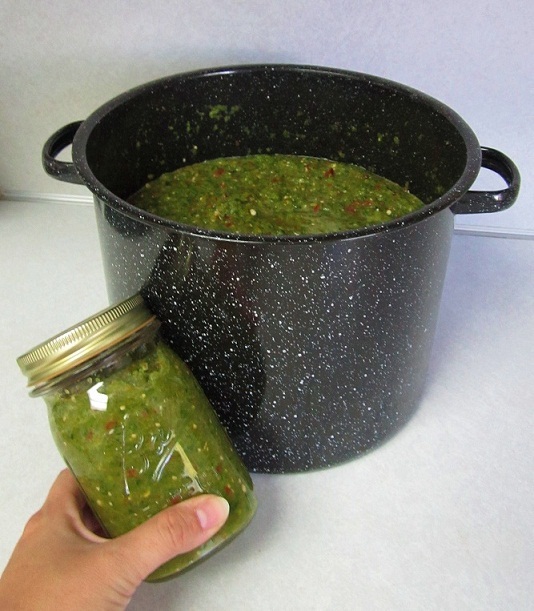 I took some time this morning and jetted off to the farmers market to grab all the fresh goodies to whip up the annual batch of green tomato-less salsa! Cilantro, onion, garlic, peppers: annaheim, serrano, hot banana, italian roasting, and another kind I can't remember. Also, not pictured but added a ton of tomatillos from my mom's garden, plus lemon and lime juice. All mixed up in a big ole blender I'll let it sit in the fridge for a few days so it can blend all together before I freeze it up. 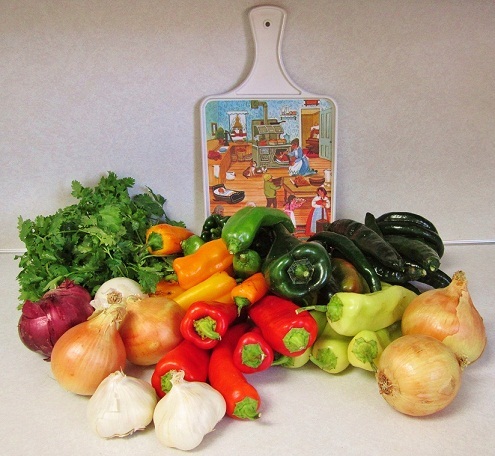 Nice and spicy to use during the colder months in recipes and for straight up chips n salsa! Sometimes you’re a No Show. 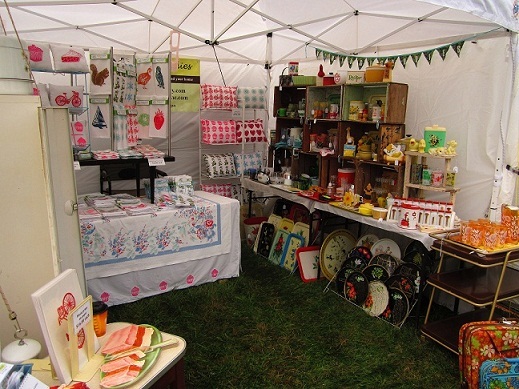 artgoodies will NOT be at the Renegade Fair in Chicago this weekend, nor at The Country Living Fair in OH or GA this year. I will miss seeing all of you but just couldn’t take the time out of the studio for travel and shows this year. I’m so very thankful to be this busy but it means some things have to get crossed off the list. You can still find artgoodies and vintagegoodies items online of course! AND like me on Facebook here or follow me on Twitter here for secret Sales! Hope to see you next year! Etsy- “Get The Look” blog feature! Etsy’s Get The Look blog series is a favorite of mine. I love being able to have a glimpse into peoples homes/studios. It really gives an insight into their personality, collections, and lifestyle. I’m super honored to have my home featured! AND thanks so much to everyone for all your super nice comments! To check out the post click here! You can see more on my flickr photostream plus a reminder that a lot of items in my color of the month vignettes are for sale in my vintage shop!